The Original Loopholes Weren’t Grey Areas In Laws Or Regulations But? Historically, A "Devil's Advocate" Was Employed To Argue Against? In modern vernacular, a “loophole” is a grey area or ambiguity in a law or regulation that someone can exploit to create an outcome in their favor. Common examples of widely exploited loopholes are those found in tax code (the “Double Irish arrangement” is a tax loophole exploited by large corporations to avoid taxation, for instance) and marriage laws (“marriages of convenience” are marriages based not on romantic love, but legal protections offered to married couples). Long before we used the term to refer to cracks in the rules, however, loopholes were literal cracks in castle walls that allowed archers to gain an advantage against forces attacking their fortifications. Loopholes was a common synonym for arrow slits, narrow openings in castle walls that allowed archers to fire out of the wall while exposing the absolute minimum amount of their bodies for enemy archers to return fire upon. 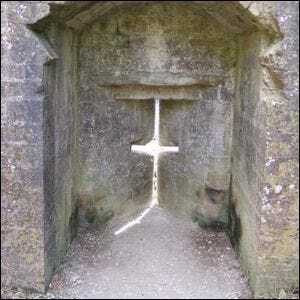 One common design, seen here in the ruins of Corfe Castle in England, was a cross shape which allowed the archer to raise and lower the elevation angle of their arrow as well as move it side to side.